Flumen makes available to ultra-light spinning a great classic of fly fishing: Lethal Weapon. This very effective streamer is realized with hook reverse mounting, high mobility fibers and a light weight on the head to make it work on the bottom in small hops simulating a small forage fish that feeds on micro-organisms on the bottom. 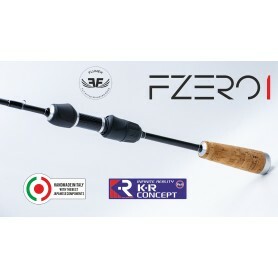 Under these premises, being able by a spinning rod to easily cast lures heavier than with fly fishing tackle, we tried to create a version of this lure for the Fly Style Spinning and so after countless tests, the Lethal Weapon FX was born. The core of the project is a brass, big head, machined from full by CNC machines, suitable to be mounted on a hook size 6 reaching the considerable weight of 3 grams. To this head is then applied a lip, like in minnows, to increase the dynamism of the lure, then it is covered with high mobility fibres, 3D XL real life eyes and a cover of transparent anti-shock resin are applied too. As the classic Lethal Weapon, also the Flumen FX works at its best used in the vicinity of the bottom, which is quickly reached thanks to the favourable weight/size ratio. Making it bounce with a small jerk, you get the classic movement of the Lethal Weapon, but in addition to this its lip adds more movement , in fact, by a longer jerk the Lethal Weapon FX rises from the bottom and begins to swim towards the surface just like a small forage fish, having in this way two distinct movements and both very enticing!